We recommend only buying an orange diamond from a vendor with high-quality photos, like James Allen or Leibish & Co. Color varies even within a specific color grade, and you want to make sure you’re getting what you pay for. In our experience, Leibish & Co. offers the best prices and customer experience in the Fancy Color Diamond market. They also provide the highest level of expertise when it comes to optimizing the color of the stone in jewelry settings. The presence of nitrogen within the diamond is the main source of the orange color, just as it is for yellow stones. The difference between orange and yellow diamonds is how the nitrogen atoms are grouped during the diamond’s formation. The arrangement, which is called hyper-specific, absorbs hints of blue and yellow light, thus creating an orange color. Similar to yellow and brown diamonds, orange diamonds have a nickname and are sometimes referred to as pumpkin diamonds. The nickname is due to their likeness to the large squash’s color and a famous 5.54 Carat stone called the pumpkin diamond. The color intensity levels for orange diamonds are graded by the GIA as Faint Orange, Very Light Orange, Light Orange, Fancy Light Orange, Fancy, Fancy Intense Orange, Fancy Vivid Orange and Fancy Deep Orange. The two latter color intensity levels are the most desired and the most expensive. Like other Fancy Colored Diamonds, the orange diamond often has a secondary hue or overtone, such as yellow or brown. This 0.93 Carat vivid yellow-orange diamond is an example of a stunning orange hue with a slight yellowish tone. A pure orange diamond, with no overtone colors, is considered among the rarest stones that exist. It’s difficult to rank rarity, but gemologists often consider orange diamonds to be the fourth or fifth rarest color, just after red, violet, pink and blue. Similar to all other natural Fancy Color Diamonds, those found in the purest form with a single color are considered the most valuable. The GIA rarely grades an orange stone as a pure color, making them extremely difficult to find—and when you do, they’re priced very high. For example, this is an incredibly rare and expensive fancy vivid orange diamond. Orange diamonds drop in price dramatically if they have a secondary or modifying color. The majority of orange diamonds are found with some form of a color combination. Orange diamonds often contain secondary hues of brown, brownish, yellow, yellowish, brownish yellow and pinkish. Other combinations may exist, but they’ll include these colors: brown, yellow or pink. 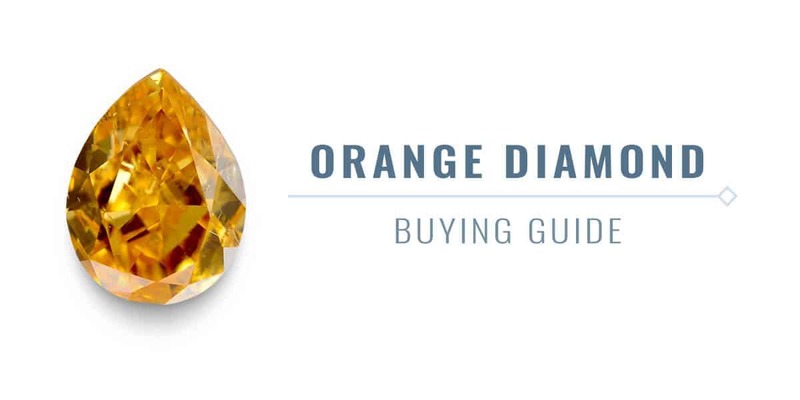 If you’re fortunate enough to purchase an orange diamond, ensure that it’s set properly. Find inspiration below for beautiful orange diamond engagement rings. Accent your orange diamond with smaller side diamonds. Choose colorless diamonds to help the orange center stone stand out. Highlight the originality of your orange diamond with an ornate ring setting. Consider a pavé style with smaller diamonds embedded along the band. Lift your orange diamond above the rest of the ring in a prong setting for a pronounced look. The orange color is very unique for diamonds and for jewelry in general. More and more individuals are seeking to incorporate unusual elements into their jewelry. And the orange diamond, often sought after by collectors, definitely helps do the job. Select a stunning orange diamond that optimizes your budget. Contact our experts for assistance with your search.